Trailing Arbutus (Epigaea repens) is a very uncommon plant of shady hillsides. It is an evergreen, and so requires a place where it will not be smothered by leaves. This usually means a slope along a wooded section where the leaves don't stay, but this also means it is very subject to erosion. It doesn't take much for it to get washed away or trampled. The male and female flowers are also normally on separate plants, so it doesn't set fruit very reliably, the plants sometimes being spread a bit far from each other for the pollinators to find the different ones. Add to the fact that it requires a specific symbiotic mycorrhizal fungi to also be present, and you can see why this plant is getting rare and rarer. This plant goes by various names. The Genus Epigaea means " on the Earth." The scientific epithet repens means "creeping." So what you have is the very descriptive name of the plant who "creeps on the Earth." That is indeed what this little woody plant does, forming small mats that rarely are taller than 6 inches and forming little ground covers over a very long period of time. Ground Laurel, as it is sometimes called, is an extremely slow grower. Trailing Arbutus in its typical habitat, creeping down a wooded hillside. Trailing Arbutus is also referred to as Plymouth Mayflower, or sometimes just Mayflower. Since it is one of the first plants to bloom, well before May, the name is actually derived from a legend. It is said that the first bloom the pilgrims trying to settle in Plymouth in 1621 saw was this plant, whom they named after their ship. This member of the Heath family (Ericaceae) is also sometimes called Winter Pink, Mountain Pink, Gravel Plant, or Shadflower (supposedly blooming in time with the influx of migrating shad fish). Two species of caterpillars also feed on the leaves. The flowers are said to be edible and quite tasty, but the plant is getting so rare, that to eat them is a shame, and an actual crime in some areas. I've never tried to taste one. But Trailing Arbutus has been used by people for more than just food in the past. The Algonquian Quebec tribes used a leaf infusion to treat kidney ailments. It turns out that the leaves do contain a substance called arbutin that has been used medicinally to treat kidney stones and urinary tract disorders. The Cherokee also made use of the plant, to treat abdominal pain, induce vomiting, treat diarrhea, indigestion, in addition to kidneys. The Haudenosaunee (sometimes called the Iroquois) thought it could be used for labor pains, rheumatism, kidney issues, and indigestion. For the Potawatomi, it was a sacred tribal flower. So there's a lot to this little woodland creeper, though it gets harder to find every year. Though sometimes sold commercially, please make sure that it is not collected from the wild. If its is disturbed, the symbiotic fungal relationship is usually broken and the plant soon dies. So please never remove it from the wild. If you are lucky enough to find it, enjoy its beauty and fragrance, it is well deserving of being the floral emblem of Nova Scotia and state flower of Massachusetts, and was the Virginia Native Plant Society 2001 Plant of the Year. Cut-leaf Toothwort (Cardamine concatenata, formerly Dentaria lacinata) is a spring wildflower of rich, deciduous woods. It is in the Brassicaceae, or Mustard Family. This plant rarely grows over a foot tall. It is an ephemeral, producing leaves, flowering, seeding, and then dying back by the time the trees leaf out and sunlight is no longer available. Its white flowers have the petals in a cross-shape typical of the "cresses" or mustard family. During cloudy weather and at night, they hang downwards and close, protecting the nectar they hold from rain and the elements. These flowers are pollinated mostly by solitary bees and a few flies. The leaves on this species are in a whorl of three that grow around the stem all pretty much on the same level. They are deeply divided, thus giving them the "cut-leaf" portion of their name. This trait also was what gave them their former scientific epithet of lacinata. The position and shape of the leaves differentiates them from a few of the other Toothworts that are occasionally encountered, though none are as common as Cut-leaf in the immediate DC area regardless. The cut-leaf whorls of leaves of the Toothwort in my yard. The name Toothwort comes from the supposed similarity of its bumpy root to a tooth. This once also helped give it its former Genus name of Dentaria. The suffix -wort often signifies an herbal use, and this plant is no exception. The roots' similarity to teeth was taken as a natural symbol for using it to treat tooth problems, something referred to as the Doctrine of Signatures (that a higher power had left a sign on the plant as to what it was to be used for). Toothworts have been used in the past to treat dental issues by various cultures. But is has been used for other treatments as well. The Haudenosaunee, whom some call the Iroquois, for instance had numerous uses for it. A poultice of its crushed roots was applied to the head for headaches. It was used to treat colds, wounds, and as an appetite stimulant. It was also used to deal with heart ailments. Interestingly, its current Genus name of Cardamine is derived from a Greek term for a mustard plant that was also used to strengthen the heart. The Haudenosaunee were said to rub Toothwort on guns, traps, fishing line, and hooks as a "hunting medicine." Some would carry either the root or plant on their person or in their mouths in the belief it could attract women. It was even thought that this plant could be used to help with divination. Of course it could just be eaten as well. It's use by many people as an edible give it other names, such as Pepper-root or Wild Horseradish. The ground roots mixed with vinegar are sometimes used as in a similar manner as horseradish. Indeed, the roots have been eaten raw, cooked or salted for generations. This of course kills the plant however and so should only be done where it is plentiful or grown in a shady garden. Toothworts actually are not difficult to grow in rich, shady garden conditions. The roots are easily planted, but hate being disturbed while in bloom. It can also be grown from seed. The seeds though are not always easy to collect, as they hang in pods from pollinated flowers, but split and shoot the seeds a short distance away when they are ripe. It also may take 3-4 years for the plants to store enough energy in their roots to finally flower from the time they sprout from seed. Despite its short growing season, Toothworts serve as host plants, caterpillar food, for 6 different species. Locally, both Falcate Orange-tips and West Virginia White butterflies use it. For the West Virginia White butterfly caterpillar, for whom it is the most preferred food almost to the exclusion of all others, this has led to its extirpation in many locations. West Virginia White butterflies come out in the early spring and fly in search of Toothworts. They land on plants when they believe they've found them and "drum" or scratch the surface with their front legs, which serve to also "taste" the compounds within the leaf surface. When the butterfly detects mustard oils, it knows to lay its eggs. The problem is with the spread of the inavsive exotic plant Garlic Mustard. It grows much more prolifically than Toothworts do, and also secretes chemicals which inhibit the germination of other plants. This chemical warfare by plants is called allelopathy, and is in addition to simply out competing native plants. Slowly Garlic Mustard replaces the natives. For the West Virginia Whites, this is deadly. The caterpillars cannot feed on the similar mustard oils of Garlic Mustard, and so are poisoned and die. As the invasive Garlic Mustard has spread, the butterfly has declined along with its host plant. Cut-leaf Toothwort, sometimes also called Crinkleroot (though Slender Toothwort is called this more often) or Crow's Toes, might make its appearance for a short time every spring, but is an important wildlflower. Not only does it serve as a valuable food plant for certain butterflies, a nectar source for native pollinators, but has been valued by people for generations, even if only for its fleeting beauty. Slender Toothwort, or Crinkleroot, has different shaped leaves (including a basal leaf and only 2 slender leaves along the stem) and is much less common in the DC area. Lesser Celandine (Ficaria verna, formerly Ranunculus ficaria) is an invasive exotic perennial that covers whole section of moist woods and waterways in spring. It can look quite attractive when it carpets the early spring with its yellow flowers (typical of plants in the Buttercup family). Looks are deceptive however, as this plant is quite aggressive and out competes native plants, particular spring ephemerals. Lesser Celandine goes by many names including Fig Buttercup, Figroot, and Pileroot. 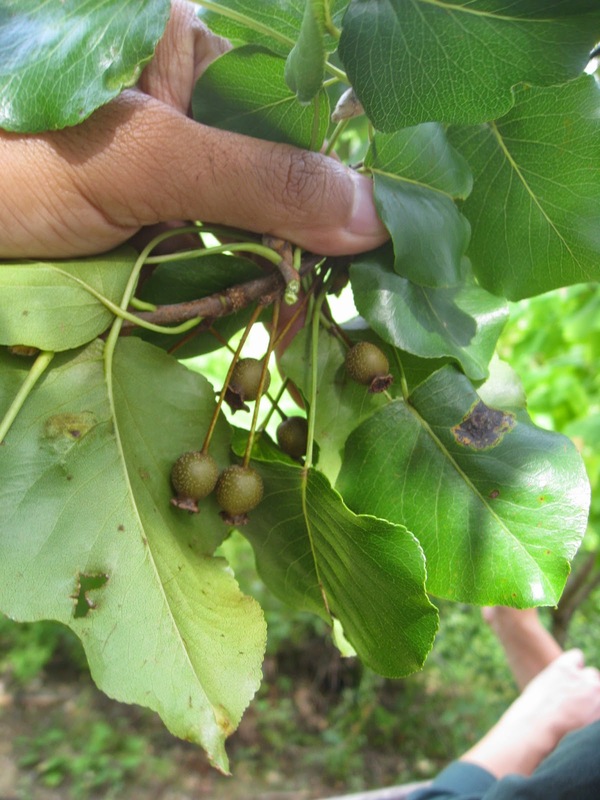 Its scientific name Ficaria means "fig" in Latin, while its species name verna means "spring." Pileroot is derived from its use in treating hemorrhoids, which can also be called "piles." It is originally from Europe and western Asia, but after its introduction as an ornamental, has spread to many other regions. We have an uncommon native plant called Marsh Marigold (Caltha palustris) that can be confused with Lesser Celandine. It is much more common in the mountains, rarely seen around the DC area. It is a taller plant that forms small clumps rather than acting as a ground cover like the Fig Buttercup often does. If in doubt though, just turn a flower over to confirm. Lesser Celandine has sepals (protective petal-like covers that protect the actual petals) which Marsh Marigold flowers lack. 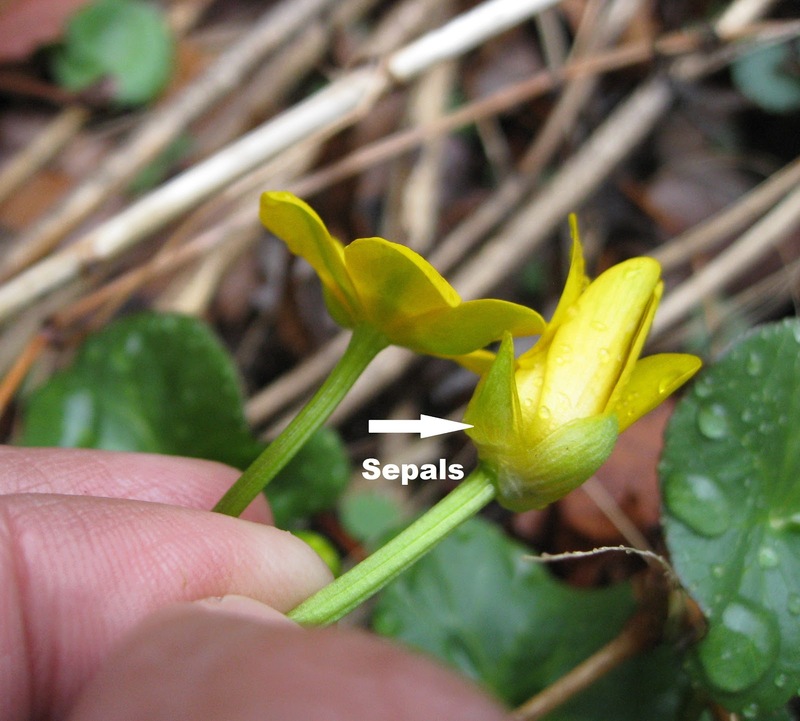 A Marsh Marigold flower to the left and a Lesser Celandine flower to the right showing the sepals that cover the petals when in bud. Although Lesser Celandine has been used medicinally, it is poisonous. It contains a compound called protoanemonin, which many other members of the buttercup family also have. It can cause blisters and rashes when it makes contact with skin. If ingested, it can cause nausea, spasms, and even paralysis. It's has proven to be fatal at times to livestock. This has led to it being declared a noxious weed in some states. But it also has been considered edible by others. The toxic compounds are rendered harmless if dried or cooked. This has led to its use as an herbal remedy and even as a vegetable. In Germany, it is sometimes called Skorbutkraut, which translates to "scurvy root" due to a belief it has high concentrations of vitamin C to prevent scurvy. Many believe this is a case of mistaken identity though with another plant that looks like it, Scurvy Grass (Cochlearia officinalis) and which is also used for the same reason, and actually does have high vitamin C concentrations. Lesser Celandine is an ephemeral, emerging in late winter and completing its flowering before the trees leaf out and then going dormant until the next season. It gets a jump start against most plants, including other native ephemerals, and eventually crowds them out. Since it goes dormant by summer, the bare patches it leaves often result in erosion. This is also to its advantage as any pieces of its bulbs can take root and spread. Disturbing the ground and breaking off pieces thus results in it being dispersed. This makes it extremely difficult to control using any mechanical methods. If you try and dig it out, you not only disturb the soil and make it easier for other invasives to take root, but any piece you miss just becomes a new plant. In reality, using herbicides in a judicious manner and at just the right time is the only practical control for this invasive. A patch of Lesser Celandine covering the ground so thickly that no other plants can grow. While it may form large spring displays of flowers, this plant is a nasty invasive. It has spread to 24 states and can completely blanket and smother native plants that provide much better, diverse habitat. It is sad to see how it carpets huge areas of what should be native ephemeral wildflowers. Lesser Celandine blanketing an area to the exclusion of other plants. An Eastern Tent Caterpillar nest on a cherry. The dots are frass, or caterpillar poop. The web nests of Eastern Tent Caterpillars (Malacosoma americana) are easily visible on woody plants of the Rose family, especially cherry trees, in the spring. If you see a web nest in the woods during spring around here, it's a pretty good bet you have a Wild Black Cherry for example. A newly born Eastern Tent caterpillar, 1st instar. The caterpillars emerge rather early in the year and form their web tents where they are safe from many predators who are unable or prefer to not try to get through the thick webs full of frass (insect poop). The caterpillars also likely sequester cyanide from the cherry they feed on and have somewhat irritating hairs to also protect them. They tend to feed at night to avoid even more potential enemies. Despite all these defenses, Cuckoos and some wasps still get their share of them. Although numerous, the caterpillars feed early enough in the year to allow their host plants to recover, having evolved with them so that they rarely cause any real harm to the native trees they feed on. It of course makes poor evolutionary sense to permanently kill off the plants you need to survive. They can however sometimes damage to nonnative cherries that did not evolve with them, though that's usually uncommon as well. An Eastern Tent caterpillar wandering off to find a place to form a cocoon and pupate. Right about late May or very early June, the caterpillars finish feeding and go on a walk-about looking for a place to form their white, web-covered cocoons. This is when many people notice them crossing roads and trails and make the assumption they are Gypsy Moths. Though similar, the Gypsy Moth caterpillars are smaller this time of year, with big-looking heads in proportion to their bodies and mostly lacking the blue marks along their sides that Eastern Tent Caterpillars have. Tent Caterpillar cocoons are a favorite target of some birds, with Blue Jays being very adept at finding them, picking through the web and hair-covered outer layer to get to the developing moth pupae inside. The very hairy, brown moths with two light-colored lines that emerge are otherwise rather drab looking. They appear mostly in late June around our region and quickly search for cherry trees and other members of the Rose family to lay their eggs upon to start the cycle all over again. An Eastern Tent egg mass on a cherry branch. By the way, Forest Tent Caterpillars are also often confused for Eastern Tent Caterpillars and are active about the same time. These do not form any web tents, prefer deeper woods, and have an interesting pattern on their backs that look like penguins all standing on top of each other. They tend to also stay in groups, particularly when young. A Forest Tent caterpillar showing the penguin-like marks on its back. Bloodroot (Sanguinaria canadensis) goes by a variety of common names due its many different uses and properties: Red Indian Paint, Redroot, Puccoon (Virginia Algonquian Indian for "blood"), Sangdragon, Coonroot, Sweet Slumber (for its narcotic properties), Snakebite (for its bitter taste), Turmeric, Papoose Flower (for the way the emerging leaf wraps around the bud), and Tetterwort (for its use in treating skin disorders, or tetters). It is the only member of its genus Sanguinaria (which again refers to the bloody color of its sap). 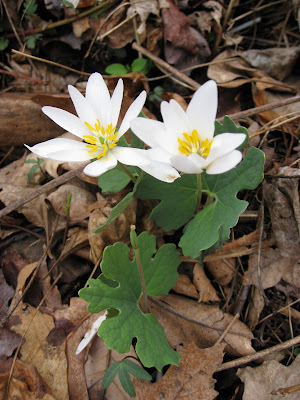 Bloodroot is one of the earliest spring ephemeral plants, blooming well before the trees leaf out and then disappearing underground until the following year. The flowers are equally fleeting, with the petals falling off easily in wind or rain, rarely lasting more than a few days at most. After only the shortest of drizzles and already the petals are falling off. They are lovely, if short lasting, but their attractiveness is a bit shallow. They actually have no nectar to offer pollinators, only pollen, so a few insects are either tricked into pollination, though some others can use the pollen. This, along with their short-lived flowers and their early bloom time when there are few insects out, would be a problem were it not that the flowers can be self pollinating (autogamy). The seeds produced are primarily distributed by ants (this is called Myrmecochory, you can find out more about this in this previous blog: http://capitalnaturalist.blogspot.com/2014/04/myrmecochory-ants-in-our-plants.html). Some believe that without ants dispersing the seeds, the plant would not be very successful. In fact, experiments run by local botany guru Marion Lobstein, showed that Bloodroot seeds who had their elaisomes removed had a much higher germination rate than those who did not. Since the ants remove the elaisomes in order to feed on them (as well as planting the seeds underground and dispersing them), this helps explain their success. A Bloodroot pod with seeds, showing the elaisome. Among the various human uses for Bloodroot, the most prominent was as a dye. All parts of the plant have a blood-like sap that can be toxic. This colorful plant juice was used by indigenous tribes for dyeing a variety of things, including as a face/body paint. Some even think the term "redskin" may have partially come from this usage by various tribes. It is believed that this toxicity led to its indigenous use as a bug repellent, with insects and ticks thus having to come in contact with the chemicals on their skins before being able to feed. Some people can have an allergic reaction to the toxic sap however. Colonists felt much safer using it to dye wool instead. The inside of the root of the aptly named Bloodroot, Sanguinaria, with a stain on my finger. The plant's chemical properties made for various medicinal practices as well. It has been utilized especially for blood disorders, menses, during childbirth, and to cause abortions, often due to the belief that its blood-red color somehow signaled these uses (a concept called the Doctrine of Signatures, that a sign was provided on a plant by a higher power as to what the plant could treat). Bloodroot has also been used for rheumatism, as a fever reducer, vomit inducer, cough suppressant, to kill ringworms, rid warts, and to treat fungal infections. The Abnaki people even used it to cause abortions in horses. During the Civil War, Southern doctor Francis Porcher was tasked with finding substitute plants to use for items no longer available due to Northern blockades. The Confederacy listed Bloodroot as part of their ethnobotanical arsenal for many breathing disorders and to induce vomiting, among other applications. It was also officially listed in the U.S. Pharmacopea up until 1926 for its pharmaceutical properties. At one point, anti plaque fighting properties were discovered and approved by the American Dental Association in 1983, it even became the main ingredient in Viadent Toothpaste. Now a days, few people use Bloodroot for much of anything except to admire its fleeting beauty. In fact, it is easy to overlook except in the early spring when its white flowers make their appearance for the briefest of time. So get out there and enjoy them while they last. A cultivar of Callery Pear in bloom. This time of year, the presence of Callery Pear becomes quite evident. Overshadowing the magnolias and foreign cherries also in bloom, these invasive plants really dominate the landscape, particularly along edges and old fields. They are quite beautiful actually, despite the flowers' smell that many people dislike. This along with their quick, compact pyramidal growth, "pest free" nature, and tolerance for such a wide array of soil and environmental conditions, made it an extremely popular landscape plant. That it was also self-incompatible, so would not produce messy fruits, was also considered a plus. Callery Pear was originally from China, but has had a landscape presence around here since at least 1960. Bradford Pear, a Callery Pear cultivar, with its flowers. However, most of these traits also make for an invasive species. This would not have been an issue if they did not reproduce, as was planned, but that particular trait failed. Although the various cultivars, especially the popular Bradford Pear, could not reproduce with their own type of cultivar, so many different cultivars were planted that they indeed do cross pollinate each other. So these have now become an invasive tree species.The Bradford Pear cultivar actually has local ties, being developed in Glen Dale, Maryland as a new wonder tree for landscaping. It was actually the official county tree for Prince George's County until 2009. Callery Pear fruits and leaves. Callery Pear escapees invading a forest edge. You can really see how invasive they are this time of year when the white blooms make these plants evident all over our countrysides. They are a pioneering species in fields and meadows, sometimes forming monoculture forests. Trying to manage and control their numbers costs natural resource agencies a fortune, but is necessary to preserve habitats. You can do your own part by eliminating seedlings, supporting local management efforts, and of course not planting any of the cultivars of Callery Pear. Be observant next time you're out and see for yourself just how dominant they are. There are so many reasons not to plant this tree besides besides their invasive tendencies that out compete native plants and crowd them out. Their pest free nature actually means that they do not support much in the way of native wildlife, no where near what native flora can support. Very few insects such as caterpillars can feed on them (and that means little food for birds, bats, and other wildlife).The woody fruits (pears) are eaten by birds once frost softens them, that is how these are spread. But by my own personal observations, it seems that invasive exotic European Starlings are among the birds who do this the most. They do not provide much food value as native plants, but often are one the few options left. The wood is also fairly weak and prone to breaking and dropping branches. All in all, there are much better native landscaping options available. A small patch of Spring Beauties from my house. A close-up from my yard. The appropriately named Virginia Spring Beauties (Claytonia virginica) are indeed beautiful, if small, spring ephemerals: growing leaves, blooming, and producing seeds before the trees fully leaf out and then disappearing until the next spring. Their scientific name was assigned by Linnaeus himself in honor of John Clayton, one of Virginia's earliest naturalists. They can be quite abundant, blanketing open woodlands so thickly they sometimes look like snow. Carolina Spring Beauty (Claytonia caroliniana) is another species that grows in the mountains West of our region. A carpet of Spring Beauties. The plants send up only one grass-like leaf during years they do not flower, two or more otherwise. The flowers themselves close up and point downwards to protect their nectar on overcast days and at night. Spring Beauties closed up, "sleeping", on a rainy day. More species of insects have been documented visiting Spring Beauties than any other spring ephemeral studied so far. The flowers show much variation and have nectar guides that appeal to many pollinators. Although each individual flower only lasts about a week (producing pollen solely the first day and nectar the remainder of the time so as to help prevent self-pollination), as a species they can bloom for quite a long time, from February through May. This allows more opportunities for different insects to visit as well as rewarding those who do. This includes a native solitary bee, Andrena erigeniae which is olgolectic, meaning it requires the pollen from this flower or it can't reproduce. Though it can visit other flowers for nectar, its young need the pollen from this flower to grow. So close is this association that the flowers open only when temperatures and conditions are high enough for the bee (and other early pollinators) to be flying. Once pollinated, the seeds "explode" as far as two feet before being dispersed by ants. They grow special attachments on their seed coats (called elaisomes) that are attractive to many species of ants in a process known as "myrmecochory" (see that Blog article for details). Claytonia show wide variation in petal size, shape, and color. The nectar guides are plainly visible on this individual. Spring Beauties are sometimes called "Fairy Spuds." This is due to the small, marble-sized tuber (corm) that forms their roots. These are quite tasty, I must admit, and were a favorite food of many indigenous tribes (and modern foragers, raw or cooked) wherever they grew, as were the leaves. Eating the root of course kills the plant however, so it is best to leave them to the numerous insects that need them instead. A "Fairy Spud" - the edible corm or root of a Spring Beauty. Occasionally you find a leaf that has little dimples and bumps all over it. That is a form of fungus, Spring Beauty Rust (Puccinia mariae-wilsoniae) that is specific to the 2 kinds of spring beauties that grow in the region, as well as a couple of other plants in the same family, Portulacaceae. A Mountain Laurel shrub in bloom. The evergreen shrub Kalmia latifolia goes by a variety of names: Mountain Laurel, Calico Bush, Spoonwood, Ivybush, Calmoun, Mountain Ivy, and American Laurel. Its Genus is named after Peter Kalm, a Swedish botanist and friend of Linnaeus who named it after him. Kalm introduced it into Europe, thinking it the most beautiful tree he had seen during his travels. Indeed, when it is in bloom with its white to pink flowers in May or June, it can be be a glorious sight. No wonder it is the state flower of both Connecticut and Pennsylvania. The spring-loaded flowers of Calico Bush. The blooms have an interesting way of dispersing pollen onto visiting insects, mostly bumblebees. Each flower has 10 spring-like stamens that are lodged in pockets on the fused petals that form the flower itself. When a pollinator lands, it triggers the stamens into launching pollen in a catapult-like fashion onto the back of of the insect. The pollen can be hurled up to a foot away, sometimes landing on other Mountain Laurel flowers and pollinating them as well. The resulting seed pods contain 600 or so seeds, which germinate best on moss. Mountain Laurel tends to grow on dry hillsides, in wooded areas, rarely reaching 30' at most. This member of the Heath (Ericaceae) family can form dense thickets of crooked trunks since it can root or layer where its branches touch the ground. These stands provide good cover and nesting sites for many animals. While the leaves are toxic, protecting it from deer browse in normal conditions, 33 caterpillar species have been recorded feeding on it. Even the flowers are poisonous, producing bitter honey for any bees visiting them, though apparently with no ill effects to the bees themselves. Peculiar to this plant are blotches on the leaves, produced by Mycosphaerella colorata fungi. Mountain Laurel Leaf Spot fungus is usually found on the leaves. In winter, the under sides of the leaves sometimes have white-edged spots. These are the eggs of Coccidae scale insect eggs, a favorite food of chickadees and kinglets. The eggs are actually covered over by the shells that were their parents. Despite the toxicity, Mountain Laurel has been used by people for a variety of purposes. According to ethnobotanist Daniel Moerman, various Native American Indian tribes made use of it. The Cherokee used a leaf infusion on cuts and scratches. A concoction was rubbed over the skin to treat rheumatism. As a liniment, it was believed to be a good treatment for cramps. It was even used as an insecticidal soap. It was even rumored to be used a suicidal drink. The Cree also considered it poisonous, yet still sometimes used it for diarrhea. Confederate doctor Francis Porcher, tasked with coming up with alternative medicines due to shortages caused by Union blockades during the Civil War, thought it could be used to treat syphilis, heart disease, and skin afflictions. The hard wood has been used to make spoons, thus its name of Spoonwood, but burls from its trunk were also used to fashion tobacco pipes. This is an interesting shrub, as if its beautiful floral displays in dark woods were no enough of a reason to like this plant. I find even the flower buds of Mountain Laurel beautiful.